Vanessa Montorsi attends the National School Counselor of the Year ceremony at The White House. When Vanessa Montorsi ’04 MA graduated from the Neag School of Education with a master’s degrees in school counseling 11 years ago, she never imagined that she would be one of 40 school counselors honored as semi-finalists for 2015 National School Counselor of the Year at a White House ceremony officiated this past January by Michelle Obama. This recognition comes for Montorsi on the heels of also being awarded the 2014 Connecticut School Counselor of the Year. Montorsi, the director of counseling at Cheshire High School in Cheshire, Conn., always knew that she wanted to find a way to make an impact on students’ lives. After teaching physical education and health during her first four years working in education, she says she wanted to experience the same connections she saw school counselors making with their students. “I took my interest of connecting with students on an individual basis, my interest in emotional safety, and my passion about the college and career process. When everything added up, it equaled school counseling,” Montorsi says. Montorsis says her favorite aspect of being a school counselor is the variety of people she is able to work with – from students to parents and teachers. No two days are the same, and her role changes on a daily basis. “One morning, I will be discussing students who are struggling academically or emotionally; the next day, I will be conducting a junior meeting to help a student plan for life outside of high school. Or, I may be addressing 400 students regarding the course selection process and reviewing the program of studies,” she says. Montorsi attributes her successful career to the well-rounded education she received as a student in the Neag School of Education. She says she was drawn to the Neag School by the variety of classes offered for graduate students and the positive direction in which the program was headed. While at Neag, Montorsi was not only able to take classes in school counseling, but also a variety of school psychology courses, gaining skills in testing and data collection that she says have proven to be very relevant in her current profession. In addition, Neag’s professors, courses, and curriculum created an atmosphere that Montorsi says challenged her and took her outside of her comfort zone. In-class exercises such as role-simulations involved the entire class in watching two students through a one-way mirror “act” out a scenario between a counselor and a student in a K-12 school. “It was nerve-wracking knowing people were watching your every move, from your body language to verbal communication. However, the experience was priceless and certainly developed me into a better counselor because I learned to use more open-ended questions,” Montorsi says. Working as a school counselor enables Montorsi to connect with students on many levels, allowing her act as a crutch during times of academic difficulty and a confidant during times of emotional stress. Montorsi is pleased that after many years of struggling to find recognition in the education world, people are starting to notice the impact school counselors have on the entire education system. Their presence in school plays a vital role in the lives of the students. Semi-finalists from the National School Counselor of the Year gather at The White House. 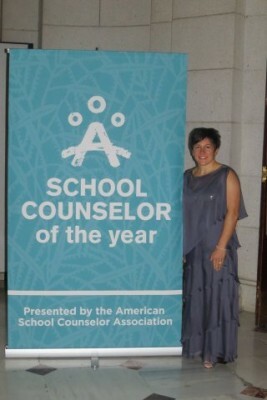 Montorsi’s January visit to Washington, D.C. to accept the National School Counselor of the Year semi-finalist award was not only a tremendous honor for her, but also for the entire school counseling profession. 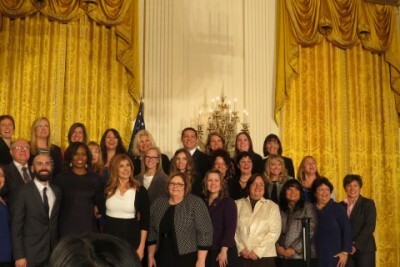 In the eight years school counselors have been recognized at the national level, this was the first year counselors were being honored at the White House. “School counselors were finally on par with principals and teachers, who have been honored at our nation’s capital for years. Except this time, the press conference being held was solely about school counselors and the significant role we play in students’ lives,” Montorsi says. Montorsi believes that school counselors “need to continue to fight the good fight” and continue to strive for recognition as a major necessity in any school setting. “Nominating a school counselor for Connecticut School Counselor of the Year goes beyond the much-deserved individual recognition; it signifies the importance of our profession and the need for more school counselors,” she says. To Montorsi, being recognized as the top school counselor in Connecticut was not about her, but all of the people who work with her at Cheshire High School Counseling Department.